Scandinavian instrumental workshops, featuring top level musicians from Denmark, Sweden, and Norway will take place on June 8, 2007 in Nisswa, Mn. 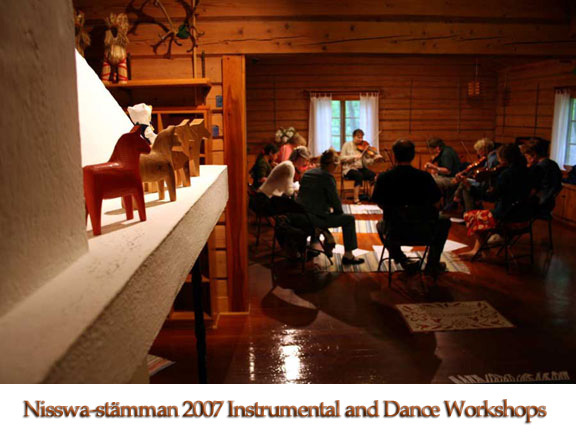 These workshops are offered in conjunction with Nisswa-stamman Scandinavian Folkmusic festival, June 8, 9, 2007. The sessions will start at 10 a.m. and continue until 3 p.m., with a lunch break in the middle. Students should be at intermediate levels and able or willing to learn tunes by ear. Cost for the sessions will be ~ $20 per each 2 hour session, or $35 for two sessions. (from the same teacher). The 'musicians lunch' will consist of cold cuts, fruit, etc and cost an extra $5. Please contact Paul Wilson for more details on these workshops and to sign up - pwilson@brainerd.net or 218-764-2994. This year, there are 5 workshops! Please sign up early! - and indicate if you would be willing to shift to an alternative workshop if the one you are signing up for doesn't attract enough musicians to make a financially viable workshop. 1. Harald Haugaard - Danish fiddling. This guy is a fantastic fiddler, and just being in the room with him for a few hours will be well worth the time and $$. He is a legend in Denmark and is still relatively young. 2. Morten Høirup - Guitar and 'other instrument' accompaniment. A fantastic guitar player, he will be willing to take anyone, playing any instrument that can do 'accompaniment' type playing...could be interesting! 5. Norwegian 'flat fiddling' (regular violin) from Marie Klåppbakken - a talented young fiddler from Vinstra, Gudbrandsdalen. Here is her note to me about her workshop: "I thought about teaching them a halling og Sjugurd Garmo from Garmo(Lom), and perhaps a springleik called Jul-leiken after Erik Bjørke from Sør Fron, and perhaps a vals called The first vals who Ole Bull teach from Myllarguten, and a reinleder called Imeland og Grimeland from Agder." 6. Alvdalens Polska dance workshop from Mary Hegge, one of our local Minnesota dance specialists. Times.... 1 pm to 3 pm in the dance barn at the Pioneer Village in Nisswa. No lunch available with this workshop....you can eat in Nisswa beforehand at several restaurants. Take a look at previous workshop pages 2006 workshop page / 2005 workshop page.